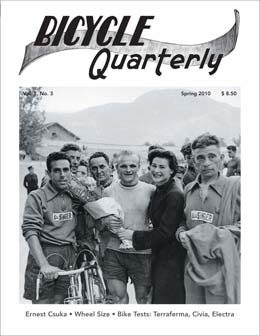 This issue is dedicated to Bicycle Quarterly’s friend, inspiration and sometime-contributor Ernest Csuka of Cycles Alex Singer. He was a strong rider and great builder. Much of what we know about bicycles came from the many discussions at the Alex Singer shop, surrounded by old frames hanging from the rafters and decades-old tools, as “Nenes” worked on a rack or brazed on various attachments to one of his gorgeous frames. With a mix of recent and historic photos, our tribute also included studio photos of a 1954 Alex Singer Randonneur, a beautiful machine that features a classic frame updated with Huret Jubilee derailleurs and Mafac brakes – the best of both worlds. We also examine wheel sizes and how they affect the handling of the bike. We built three identical bikes, except the wheel sizes were different: 26”, 650B, 700C. We tested these bikes with three riders, using narrow and wide tires. The results are interesting – there are very distinct handling differences with each wheel size and tire combination. Even though our testers came from different backgrounds (racer, 700C randonneur, 650B randonneur), all had the same preferences when it came to these test bikes. Based on these results, we were able to calculate the optimum wheel size for each tire width. This issue also saw the start of our History of Randonneuring series. Learn about Vélocio and his “School of Saint-Etienne”, the Audax in Italy and France, and the first Paris-Brest-Paris race. Perhaps the most fascinating piece of the whole issue is a report from a 506 km ride from Lyon to Nice on the Côte d’Azur in just over 24 hours – in 1908 on gravel roads, with an carbide headlamp and a twin-chain bicycle. It was an epic adventure that included carrying a revolver and navigating by the stars. 67 Blinding Headlights — a Problem?